Today we announced that Power BI will be generally available July 24th. Through the course of the preview we have added many exciting new features and capabilities, a full list is here at the bottom of this blog post. In July we will make the updates shown below, rounding out the preview and we will make Power BI generally available on July 24th. We would like to thank all of you that have provided feedback through the course of this preview, we take your feedback seriously so please continue to tell us what you think. Direct connection to SQL Server Analysis Services tabular models for data exploration. These and other new features will be available later this month. Customers are no longer limited by the visualizations provided by their software vendor. Microsoft is opening its commercial grade visualization framework and visuals built on D3.js, enabling customers and partners to easily extend and build custom visuals. Along with the visualization framework we are also delivering a test suite and tooling. All of this is available today as an open source project on GitHub at https://github.com/Microsoft/PowerBI-visuals. In the future, customers will be able to bring these custom visuals into Power BI for use in their dashboards, reports and content packs. 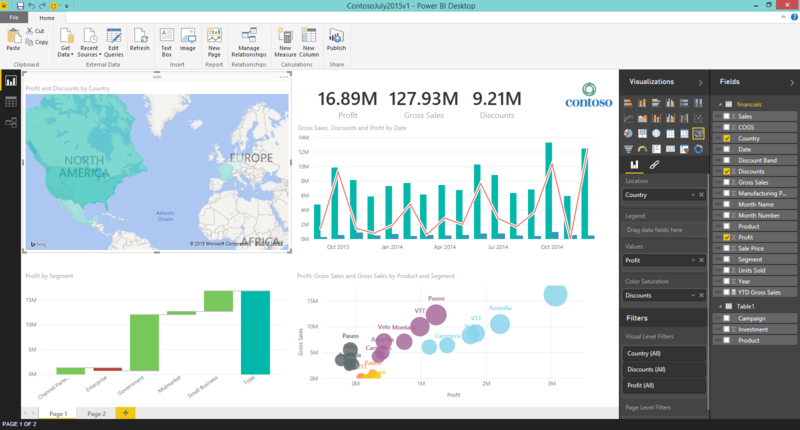 Power BI make it easy for users to visualize and analyze their data in minutes, providing pre-built solutions for popular services as part of the Power BI experience. A subscriber to a supported service can quickly connect to their account from Power BI and see their data through live dashboards and interactive reports that have been pre-built for them. We have released content packs for 16 popular services such as Salesforce.com, Marketo, and Quickbooks Online. We have announced that over the coming months we will extend this support to include content packs and integrations for Adobe Analytics, comScore, Azure Mobile Engagement, Sage, SpaceCurve, tyGraph, CircuitID, Sumo Logic, SQL Sentry, Zuora, Planview, Insightly, Troux, Inkling, and others. In addition, at GA we will introduce Organizational Content Packs which allow users, BI professionals and system integrators to build their own Content Packs to share purpose built dashboards, reports and datasets within an organization for others to consume and gain business insights. 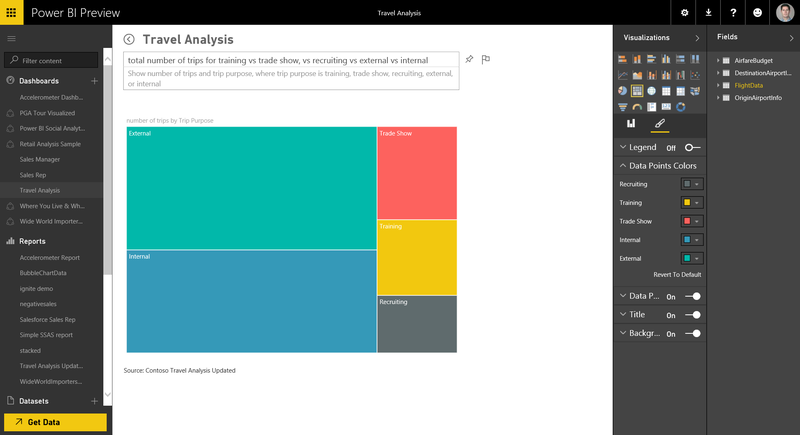 Power BI will provide support for Groups, enabling team collaboration and sharing of Power BI content across work groups. With this, teams now have the ability to collaborate and work on the same set of dashboards, reports, and datasets. Power BI will also provide full Excel support enabling users to both import Excel workbooks to build Power BI dashboards and reports, as well as view these workbooks through Excel Online as part of the Power BI experience. Today Power BI users can connect directly to SQL Server Analysis Services, Azure SQL Database, and Azure SQL Data Warehouse, querying live against these data sources. 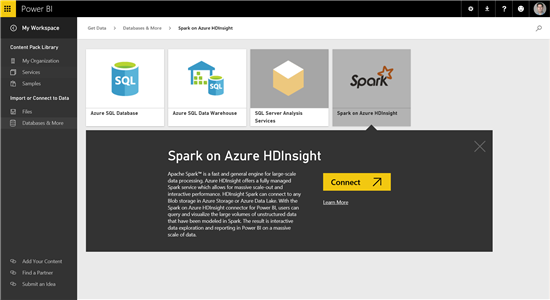 Power BI now extends this support to Apache Spark for Big Data scenarios. Now Power BI customers can directly access Big Data with connected dashboards and reports that query live to the data from the popular Apache Spark open source framework. A Power BI mobile app for Android phone is now available, adding to the existing mobile support for iPhone, iPad, and Windows devices. New visuals – Tree Map, Combo Chart, Funnel, Gauges, Area Map, Waterfall, Donut, Area Chart, Matrix and others. Thank you for trying the Power BI preview. On July 24 your preview account will be converted to a Power BI free account. Note that if you are currently using features available in Power BI Pro they will be disabled but you are free to upgrade your account to Power BI Pro at any time. 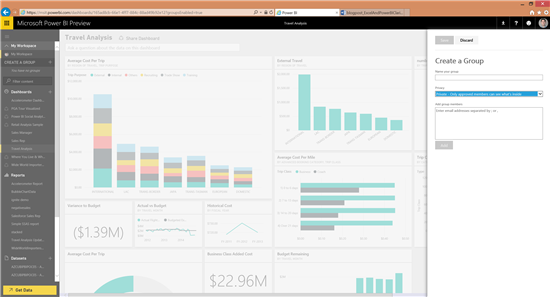 More information on Power BI and Power BI Pro is available here.